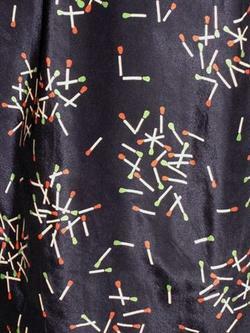 What fabric designs have you been searching for? 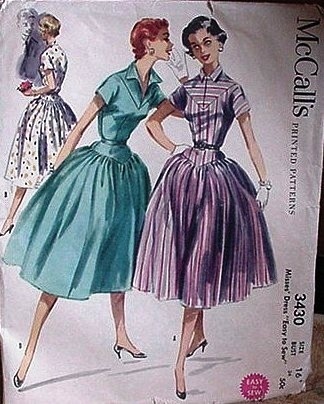 Libby sent me this image, a pattern she bought at Funkoma Vintage just for the illustration. I would have done the same. 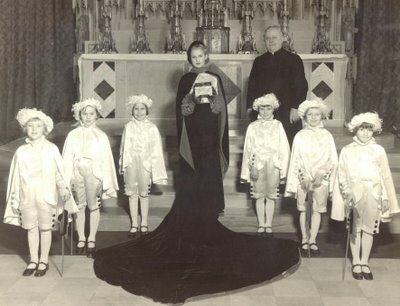 What on earth is going on in this picture? Nothing good. What was the illustrator thinking? "I know what will make women want this dress! Let's show them how catty and backstabby they can be while wearing it!" I would like to know what YOU think these women are saying to each other … leave your dialogue in the comments if you are so inspired. This also reminds me of An Idea that I've had for a while. Why isn't anyone selling large poster-size prints of great pattern images? If you scan them at a high-enough dpi you can send the images to any number of online photo-processing places and get a poster-sized print (which costs about $20, I think). And wouldn't you want a huge blowup of a great pattern as a sewing-room picture? (Heck, I'd put them all over the house!) Someone should be doing this on Etsy, frankly, and if nobody IS doing this, I present this idea to anyone who wants to start this as their home-based business, free of charge. Go right on ahead. I bet you could charge $35-40 for it, and more if you framed 'em or had them put on foamcore backing. If you do start doing this, let me know and I'll post about this here. First off, remember that most of the choices ahead of you are good. Your life will not be ruined if you buy the "wrong" machine. No one will mock or scorn you for not optimizing your purchase to the utmost. Remember that the perfect is the enemy of the good, and with sewing machines (and with other things like digital cameras and so forth) the more time you spend reading about them the more high-end features will seem like necessities … and so your "dream machine" will get more and more expensive (and further and further out of reach). These instructions are predicated on my assumption that you don't have a lot of money to spend on a machine. If you just won the lottery, have a rich uncle, or are independently wealthy, just buy whatever you see first. If it turns out wrong you can just go buy another one. 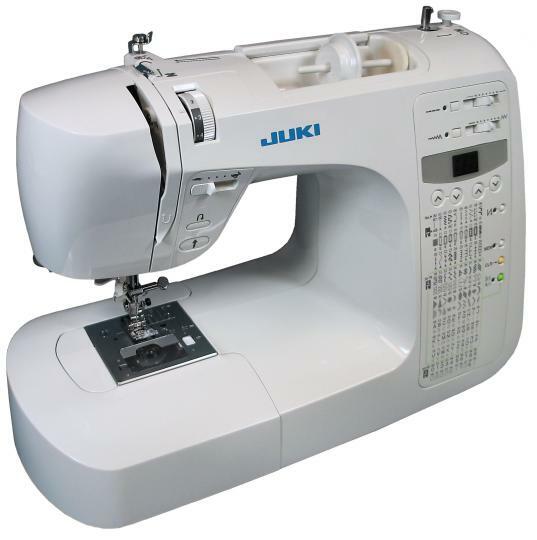 If you're new to sewing, definitely try for a used machine from your local shop. Ask about their trade-in policy. Most shops will be happy (or SHOULD BE HAPPY) to sell you something a bit simpler and then have you trade it for something fancier later, rather than sell you something so intricate you'll never use it and never come back. If you are an intermediate-level machine user (you've taken a couple of classes, made some skirts or tote bags), you probably know roughly what you like in a machine, and I recommend buying a used machine that was higher-end when it was new. Something with a good straight stitch and a good zigzag and maybe a buttonhole function, but not a lot of fancy embroidery stitches (unless embroidery stitches are your reason for sewing). Again, trying things out at a local shop is a good idea for you. You can also do the whole Craigslist/PennySaver/estate sale thing, too, if there's a good local repair shop you trust, because the price of a used machine plus a tuneup (my tuneups usually run $80) is cheap enough to be worth it. (Try to see if someone selling you a used machine will let you bring it back to them if the repair shop says it's not repairable. An estate sale won't let you do this, and if the machine is under $100 probably a Craigslist seller won't either. If the machine turns on and runs it is probably tune-uppable. If it won't run at all, makes horrible grinding noises, or smokes … not so much. Also, don't buy something that seems to be missing a lot of parts.) If you buy this kind of machine, you'll know when you've outgrown it — you'll start wanting to make things that need special presser feet or you'll start being picky about the quality of your topstitching. Then you can upgrade. — in a mass-market store like Walmart or Target. They are usually intended for small home alterations, not serious sewing. There are exceptions, but if you're not an experienced user you won't know if you have found an exception. Also, these model numbers change a lot so it's hard to find good reviews online … (if anyone knows different or has "good" models that are available at these places, please leave them in the comments)! — are advertised as "special class machines" or "special buys". They're not and they aren't. They're usually low-end no-name models and won't come with classes or a good warranty. — themed with any kind of licensed character. The money they spent to license Barbie or Hello Kitty or whatever is money they didn't spend making the machine comparable to other machines at the same price. If you are an experienced machine user, then you need to figure out your price range. Figure out your price range and then ONLY LOOK AT MACHINES IN THAT PRICE RANGE, unless you want to suffer wow-feature creep. Wow-feature creep is what happens when you see that the next machine up (that is $200 more) not only has automatic buttonholes, but also orders you new buttons from the internet every time you use one (for example) … wow! Now only a button-ordering machine will do … if you are tempted by wow-feature creep, can you make a list of FIVE projects you've ever made that special feature X would have helped you complete? Just one doesn't count. And a special wow-feature that requires ANOTHER purchase (like extra software, etc.) needs to have ten projects to justify it or it double doesn't count. Once you have a firm grasp on your budget (you may have to wrassle with it a bit; I find it helps to point out to myself that I bought my first machine for $140 and used it for fifteen years; what does your price look like spread over fifteen years? A lot better, right?) sit down and make a list. What do you like about your current machine, and what don't you like? I liked that my old New Home was quiet, simple, and made nice stitches. I didn't like that the bobbin was complicated to load, and that it didn't make good buttonholes. So what I was looking for was a machine that did everything my New Home does AND made good automatic buttonholes and had a drop-in bobbin. When you've found the good-enough option, BUY IT. And don't let yourself go back and read reviews of OTHER machines after you've placed your order. (That way lies madness.) Instead, re-read good reviews of the machine you've picked out and wallow in your happy choice. Make plans of what you'll sew first, second, third … Clean up your sewing area for the new arrival. Buy some new machine needles (unless the dealer threw in a pack for free, which they should, honestly). And buy it from wherever you like (although the local store is still a great option for instant gratification, if for nothing else). Oh! And I almost forgot: Denise at The Blue Gardenia is having a BIG pattern sale! Buy 3 or more items, get 35% off! It runs through midnight (PST) TONIGHT. I hope you had a marvelous holiday, with lots of loved and lovely people around and laughing and eating delicious things. I had a fantastic time myself, and part of that was thanks to all of you! So far I have made TWO shirtdresses. Yes, two. With the collars and the buttonholes and everything, and one was even Liberty-print! (The other was polka-dot. I'll have pictures probably early next week.) The machine is like a dream for buttonholes. I've always wanted my own robot, and now I have one! A robot that makes buttonholes, the best kind. So — thank you all so much! (And thank you to our lovely advertisers, too.) I love the new machine and I promise to use it A LOT.